The latest in our line of stunning alternative photo booths for hire is this micro camper replica with a fully functioning booth in the back, perfect for festivals, or alternative events throughout Shropshire, the U.K. and Europe. 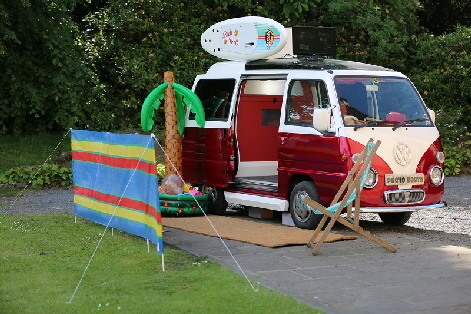 We have fitted a mini VW camper van replica with a fully working photo booth system, touch screen control unit, Canon DSLR camera and a Sony dye sublimation printer dispensing prints from the roof mounted surfboard and playing Beach Boys music through a digital sound system. 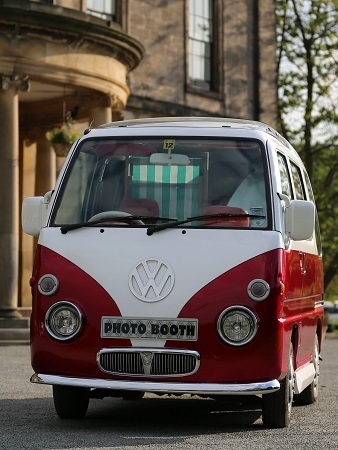 Stunning mini VW replica camper van photo booth hire throughout Shropshire the UK, and Europe, why have a party in a box, when you can have your guests being photographed in the back of this stunning camper van. This can also be custom wrapped and themed for corporate events, sales promotions and exhibitions, with custom themed control systems and full print design and customisation.